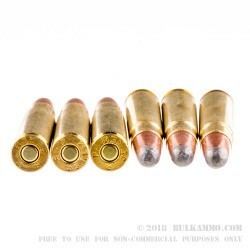 The .35 Remington is a great round for big game in wooded areas at moderate ranges from about 90 yards up to 175 yards. The classic load for this firearm is this Remington Core-Lokt with a 200 grain round nose soft point projectile. For hunting the deer where they live, this .35 Remington load is about as good as it gets. The 200 grain soft point rounded design makes it very effective in wooded areas and areas with high brush and lots of foliage. Some believe that the .35 Remington is a relatively weak round for big game because of the limited capacity and pressure in the loading. For what it’s made for it’s more than enough. This round is loaded optimally to improve your shooting in an area with cover and while going after native big game. The knock down power of the round is significant. It’s been a proven big game cartridge in the United States and beyond, especially as a bush gun. 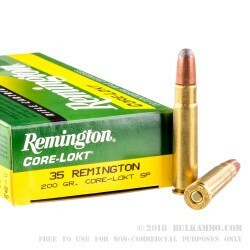 The incredible reputation for the Core-Lokt bullet and this 35 Rem ammo makes this a best in class load for those who want a factory, mainstream load. 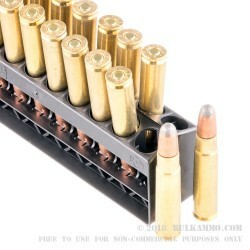 The brass is reloadable and high quality, and the ballistics are right in line with the standard loads across the board.